For many fortunates in the movie life, there are moments of epiphany, that crossroad where you realize a screen world is one you'll be occupying. 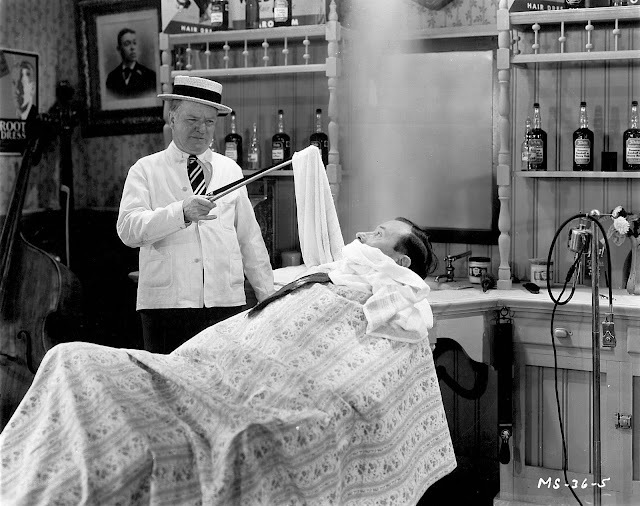 My rendezvous with classic comedy to settle future dedication happened August 1968 when a then-sister-in-law drove me to Wake Forest College (since University) for a triple bill of Buster Keaton in Sherlock Jr., Laurel and Hardy in Double Whoopee, and W.C. Fields in The Barber Shop. I've tried since to imagine a more ideal medley to combust lifelong interest, and so far, none occur to me. Interesting how you can have fifty people sitting before such a presentation, most having a good time, but only one (if that) coming away transformed. It wasn't as though I hadn't seen these personalities before. Keaton was familiar in old age 60's guise, but never before (for me) the comic astonisher he was here. Laurel and Hardy had been (and would be again) objects of Robert Youngson sampling, like slices of a cake mostly eaten, for it was obvious he had cheery-picked subjects originally fuller-fleshed. As to Fields, there'd been pictures in books, glimpses on television, and older folks to guarantee fun should I encounter him. Sherlock Jr. was the program's centerpiece. It's just occurs to me ... this was the first silent feature I saw projected on a screen, which is to acknowledge if nothing else how tough coming across such occasion was back then. Wake Forest had a brilliant student programmer named Doug Lemza. He'd later edit Films Inc.'s Rediscovering The American Cinema catalogues and is currently branch manager for Criterion Pictures USA in Morton Grove, Illinois. Thanks to his stewardship, Wake's was a world class film site. I used to get my sister's boyfriend, a student there in the sixties, to bring home program notes Lemza wrote. Not sure if he was still there the night of Sherlock Jr., but momentum from his efforts kept WFU's series aloft for years after Lemza's departure (even unto a latter seventies period when I attended law school there). Rose-colored memory suggests it was an ideal venue and presentation that night. In fact, to go back from privileged DVD access would be a jolt for how austere these shows truly were. We sat in a teaching auditorium with hard-backed chairs. I don't remember music being played. Certainly there was no live accompaniment. The format would have been 16mm and I'm guessing long gone Audio-Brandon supplied prints. At least during the seventies, Sherlock Jr. rented for $75. Double Whoopee and The Barber Shop were probably got for a ten spot each. You never knew in those days what shape film would be in when it arrived. My later experience booking for college would amount to baptisms of fire for reels damaged, footage missing, etc. For at least this occasion at Wake, however, it was magic unbound, an experience I couldn't have imagined improving upon. I'd actually been given a choice that week. There would be one trip to Winston-Salem, either to the comedies at Wake Forest or a Saturday kid show of longed-to-see House Of Usher at downtown's Carolina Theatre (later site of Jesse James). Which to select at age fourteen with both such vital wants? The pick was a right one in hindsight. It started me collecting on 8mm whatever I could locate of these clowns. You could, of course, buy much of Laurel and Hardy's output from licensing Blackhawk Films. 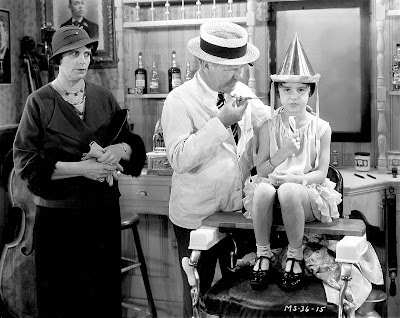 The latter also secured narrow-gauge rights to The Barber Shop and three other shorts W.C. Fields did for Mack Sennett in the early thirties. 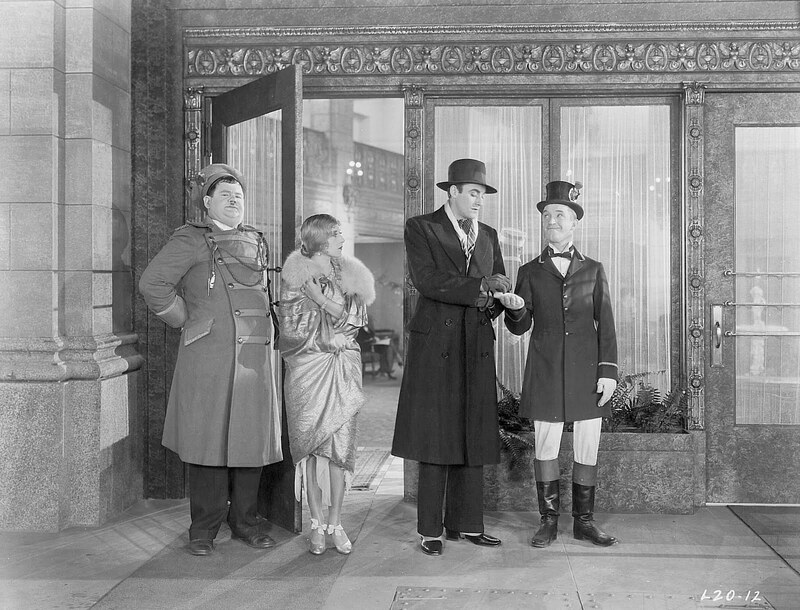 Double Whoopee had made a deep impression for being initial view of a complete silent Laurel and Hardy. To own it was entering 1929 exhibition on ground floors for me. L&H fans --- how many times have you watched those two reels since childhood? Lately I've found myself going back to Double Whoopee on 8mm Blackhawk rather than enhanced delivery on DVD. For me, it is the more authentic format, closest to what I experienced from beginnings, and likeliest to call up sensation felt so many screenings ago when movies at home were new and novel. Never do I come away from the best Laurel and Hardys without a fresh appreciation. Double Whoopee is such a jewel of comic invention. Stan and Babe at the hotel register ... falls down an elevator shaft ... the boys quarrelling over a tip ... and pay-off of another "Battle Of The Century," this time with eye-poking, shin-kicking, the customary works. There are at least five sections you could mix and match anywhere to blissful comic effect. Youngson spotted Double Whoopee thus in multiple compilations without repeating himself (well, maybe the Jean Harlow entrance, such a seminal moment as to justify a go-back). 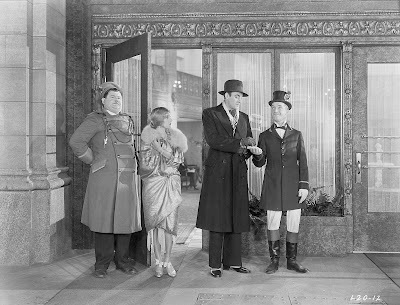 Much more at Greenbriar Archives: Buster Keaton in The General, Spite Marriage, Le Roi des Champs-Elysses, and Keaton Columbia Shorts. Laurel and Hardy's Fads and Flaps, Babes In Toyland, L&H Fox Comedies, From The Forties Forward, and Time For Some Laurel and Hardy. W.C. Fields Born This Day, The Great Man --- Parts One and Two, Sally Of The Sawdust and Poppy, Alice In Wonderland, and Follow The Boys. 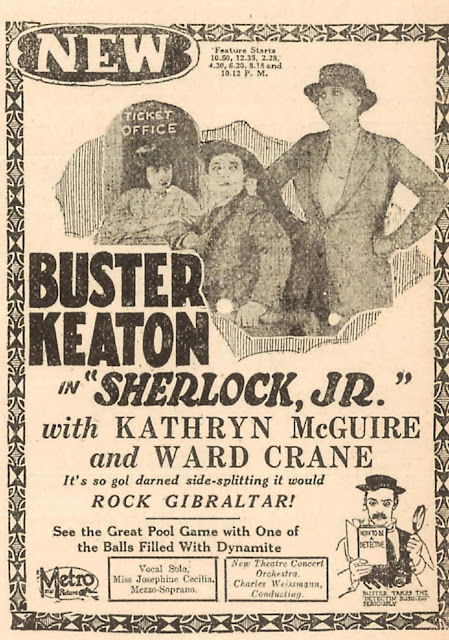 Hometown Salisbury, North Carolina, usually near the top of the exhibition chain, didn't get SHERLOCK, JR. until eleven months after its April, 1924 release. It played the IRIS THEATRE March 9-10-11, 1925. Could not post this. Perhaps it is too long. Will share it with you directly. 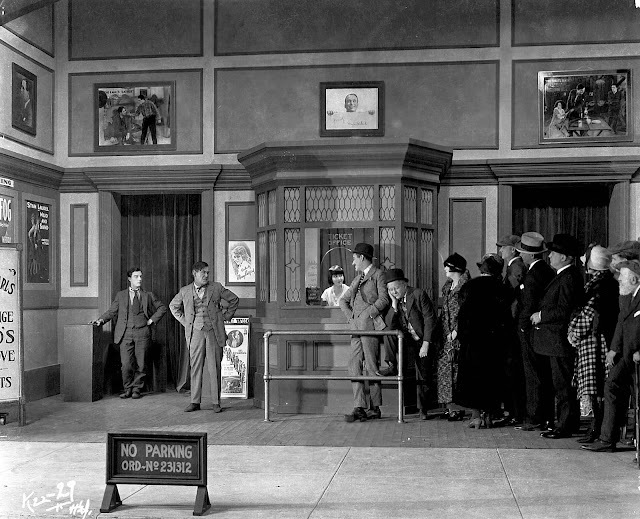 I once forced an audience of close to one thousand people who'd come for The Marx Brothers in A DAY AT THE RACES to watch Buster Keaton in SEVEN CHANCES first. This was in an old church that had been converted into a theatre. The audience laughed so hard the building shook (and it is a big solid building). I stuck SHERLOCK JR. into the middle of an animation festival I programmed for another one thousand seat theatre. The owner of the theatre was opposed to it and was really angry I had done it. His audience was entranced from the first moment the film began. Then, as they saw gags they thought could only be done in an animated cartoon, they became excited. When the pool sequence you talked about came on the screen the entire theatre en masse moved forward in their seats to get closer to the action. When the film ended they went wild. That is an old trick I used to turn audiences (which are always very conservative) on to new things. We could have developed a whole new cash cow for the theatre owner out of that moment but he was unable to seize it. Seeing THE PHILADELPHIA STORY before a current film, today’s generation walked out amazed at the sophistication of the language. “Show us more,” they cried. Today people see these films on high quality DVD and Blu-ray copies that put to shame even the best 35mm and 16mm prints we had to deal with. What they do not get, that we did, is the experience of watching these films engage not a large audience, but a HUGE one. The BBC ran, over the air in England, the twenty minutes of solid laughter that is the climax of Chaplin’s THE GOLD RUSH when it premiered at The Albert Hall in London. No film (and no film maker) can duplicate that today. People look at these films as old movies. They are not. They are young films from the youth of the cinema when the industry was suffused with the wonderful arrogance, boldness, brashness and dedication of youth. Like the young always do, the industry then took chances, risks, and was exciting. Most of today’s pictures are pale by comparison. As we get physically older, our diet gets restricted. We make sure (most of, not me) that everything is safe and we will not be disturbed. We take medication (me included) for arthritis. That is what today’s films and film makers by and large do. Scripts are vetted to ensure as few as possible will be upset. We know that it is not really the star at risk (as Chaplin and Keaton were) but an anonymous stunt person. Today’s motion pictures are in fact old movies. Seeing a film in a five hundred seat house can not compare with sitting with five thousand people all sharing the same wonderful moment. I saw Richard Lester’s THE THREE MUSKETEERS in a five thousand seat house. From the moment the picture started it had each of us in celluloid Heaven. My thought, on leaving, was that if the second half was as faithful to the spirit of Dumas as the first half had been, it was going to be an awesome downer (as Milady kills just about everyone). Well, it was as faithful and I loved it for that --- tho’ the critics — ever illiterate —complained the second half was not as much fun as the first half. In a theatre, we can not push pause and go for a break. The movie has us under its thrall. The experience at home on your high quality TVs with high quality DVDs and Blu-Rays can come nowhere near that. Sitting with thousands of other people laughing hysterically at something we missed while we laugh at something they missed a few seconds later has a richness the home experience can never have. The home movie experience, while I am grateful for what it allows me, is a pale shadow of the real thing. And while I am at it, how about joining me in a thank you to those wonderful outlaw distributors who made it possible for us to have those moments such as you had with your 8mm copy of SHERLOCK JR. This is why I love showing great films to the public. When I was a kid, CBS channel 2 in New York had the MGM package and would play them late at night. 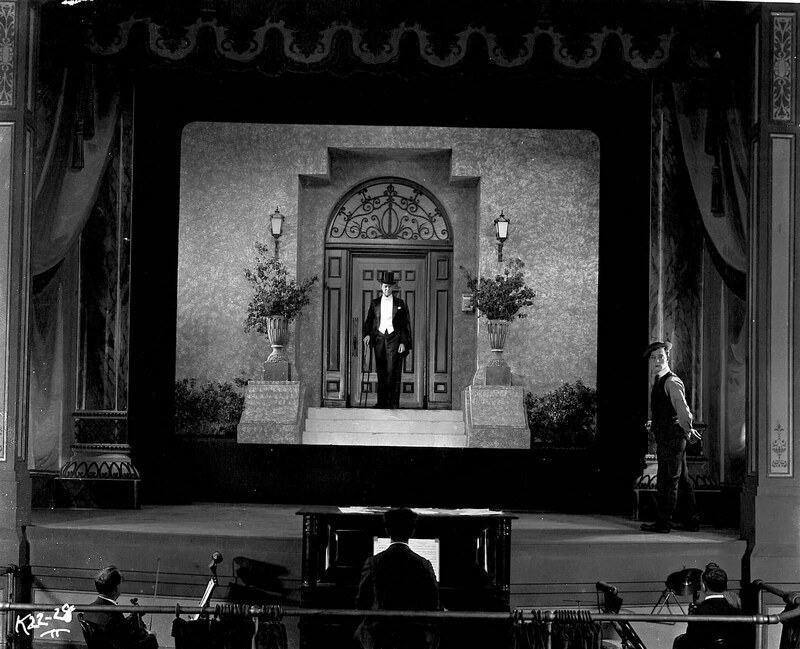 I must've been 10 or 12 when I caught Grand Hotel, and decided that old movies were where I was going to spend a great deal of my life. And I have, and never looked back. The Museum of New-York once ran a bunch of Laurel & Hardy silents with piano accompaniment. The audience's reaction, both kids and adult, to "We Faw Down" and, especially, "Putting Pants on Phillip," was something I hadn't heard from a crowd in ages. Solid, non-stop laughter that grew 'til the end. It's interesting what even a few people's reactions can do for a movie. I've run "The Laurel & Hardy Murder Case" three times for my wife and daughter (twice in English, once in Spanish!) and, despite it being one of their weaker shorts, each time they roared with laughter. And my daughter still gets spooked by some of its "scary" gags. I'll have to get my hands on the German version! Just before reading this post I was on another board, waxing nostalgic -- much less evocatively -- about Disneyland's Main Street Cinema. 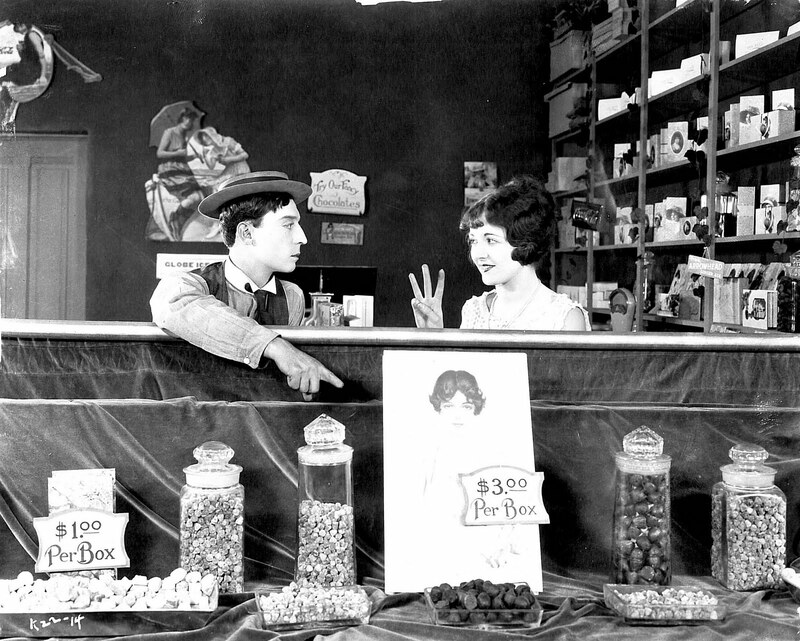 Silent comedies and opening reels from silent features played simultaneously on multiple screens around the room. I actually watched several films all the way through. It had a huge influence on my eventual 8mm collection. "Double Whoopee" was my first L&H as well, although I always felt it wasn't quite pure because they were out of their usual costumes most of the time. I remember Stan's business with the shirtless man (first artfully plucking a single chest hair, then applying flypaper) as the big crowd-pleaser. I eventually got Blackhawk releases of some of the Keaton shorts and the Harold Lloyd one-reelers, along with some Keystones. My own public exhibitions were almost subliminal. A junior high school friend was a light show impresario (this was the end of the 60s), and to complement his stuff I'd bring my projector and cast silent comedies and soundless cartoons on auditorium walls at dances. Somewhere out there, a few 50something adults forever associate "Don't Shove" and "The Blacksmith" with the sweaty palms of pubescence. I first saw Sherlock Jr. back in the late 1960's at a library film series showing here in Memphis and the audience roared. 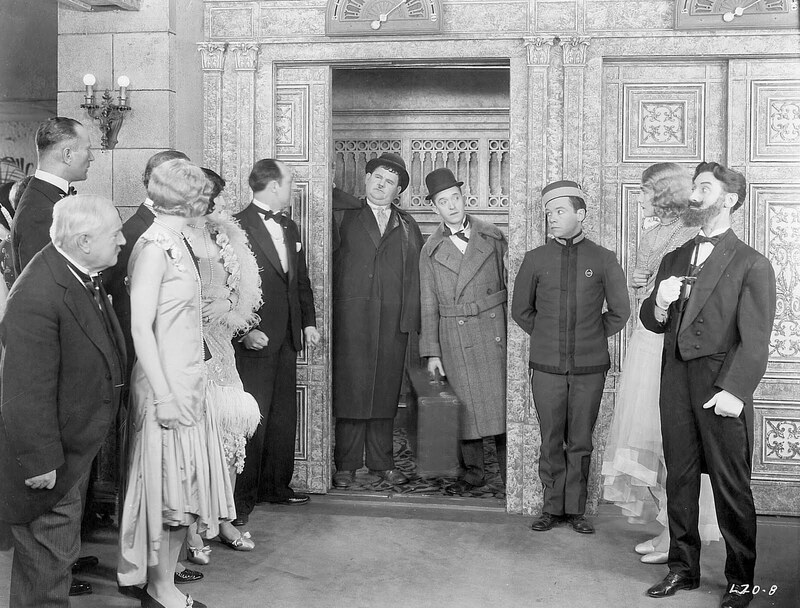 It was such a revelation how much funnier silent comedies were with a large audience. Wonderful memory. One of the reasons we started SLAPSTICON in the Washington DC area was exactly what has been talked about here, to get a large audience together to see silent and early sound comedy as it was meant to be seen. 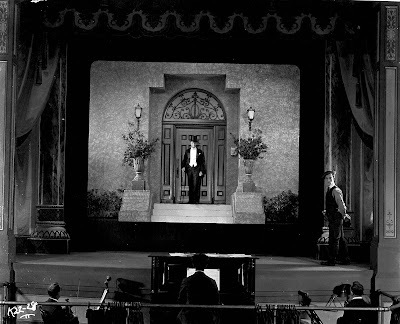 None of these films were ever meant to be watched alone, and there is no greater pleasure than watching even comics like Larry Semon and Lloyd Hamilton come to life with an audience. As you well know, it really feels good to go home tired after four days of solid laughing. Another shameless plug: SLAPSTICON 2011, July 14-17, 2011. Go to www.slapsticon.org for more info. We'll be updating the site soon with the latest info on the fest and announcing a bundle of the titles to be screened. Stay Tuned! I was watching the spanish version of Laurel and Hardy's Be Big the other night and found it to be alot funnier.Couldn't figure out what it was as they manage to match scenes and gags on the foreign versions over again without skipping a beat.